A temporary reversal in the direction of a stock’s price that goes against the prevailing trend. A retracement does not signify a change in the larger trend. On a chart where a stock’s price is generally headed upward, retracements are the small dips in price that the stock experiences during its overall upward trend. Whether an investor identifies a change in a stock’s direction as a retracement or a reversal will impact how he responds to it. Technical analysts make an important distinction between retracements and reversals. Retracements are short-term changes within a longer-term trend, while reversals indicate the end of a larger trend and the beginning of a new trend. When a retracement first begins, it is difficult to tell whether it is a retracement or a reversal. Technical analysts try to distinguish between the two using Fibonacci retracements, pivot point support and resistance levels, and trendline support and resistance levels. Market analysis to be done with perfection if we consider FIIs activity also . Is it a new start of new rally towards 6100 ? Seeing all this it can be predicted that nifty is in buy on dips mode …we may see retracement but short term trend is bullish ..positional traders keep sl 5690 and buy on dips ..intra traders may trade according to intra trends ..long and shorts . Nifty moved up with volumes and addition of OI is indicating that rally is not fake ….and not a pull back rally so those who are trapped and still holding short positions trade wisely and try to cover your losses trading on each positive and negative wave …market will move in the form of waves ..have a look at waves …you can name them eliott waves which may be spotted in each time frame . you can spot and see in charts such waves easily in each time frame ..
You can learn online ..Join Dhanvarsha today .. The Elliott Wave Principle is a detailed description of how groups of people behave. It reveals that mass psychology swings from pessimism to optimism and back in a natural sequence, creating specific and measurable patterns. The Elliott Wave Principle is named for its discoverer, Ralph Nelson Elliott. Elliott Wave Principle measures investor psychology, which is the real engine behind the stock markets. When people are optimistic about the future of a given issue, they bid the price up. Two observations will help you grasp this: First, for hundreds of years, investors have noticed that events external to the stock markets seem to have no consistent effect on the their progress. The same news that today seems to drive the markets up are as likely to drive them down tomorrow. The only reasonable conclusion is that the markets simply do not react consistently to outside events. Second, when you study historical charts, you see that the markets continuously unfold in waves. Using the Elliott Wave Principle is an exercise in probability. An Elliottician is someone who is able to identify the markets structure and anticipate the most likely next move based on our position within those structures. By knowing the wave patterns, you’ll know what the markets are likely to do next and (sometimes most importantly) what they will not do next. By using the Elliott Wave Principles, you identify the highest probable moves with the least risk. Natural gas advised at correct time and correct direction by Rehan at Dhanvarsha chat room ..
save brokerage grow more ..
Asia is green nifty is green possible opening at 1 % up sustain above 1% …i have some doubt as 20 DMA will resist up move or may repel it …. eod nifty chart is showing that nifty was traded in 3 channels ..1 is blue 1 is red and other is black ..20 dma is at 5789 …today is Friday …profit booking or short covering both cases may be there … what will be there we will see after opening and market stabilization. yesterday we have advised to buy nifty at bottom at 5575 -80 level at open chatroom . Today you all will gain 50 to 70 Nifty /option points at open . Nifty eod candles spinning bottom then hammer then doji and if we further analyse …it is looking like bullish harami at nifty chart all are indicating for a trend reversal …will we see an upblast /short covering / pullback rally today ? stock specific moves are expected .. 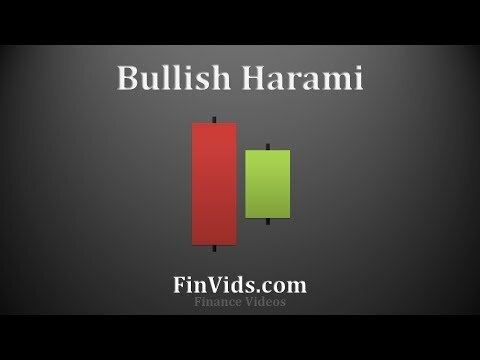 Bullish harami ..is a trend reversal candle ..
A candlestick chart pattern in which a large candlestick is followed by a smaller candlestick whose body is located within the vertical range of the larger body. In terms of candlestick colors, the bullish harami is a downtrend of negative-colored (black) candlesticks engulfing a small positive (white) candlestick, giving a sign of a reversal of the downward trend. it was shared yesterday ..
nifty closed making hammer with long tail waiting for confirmation. yesterday was panic and play. buy on dips later book gains for better intraday returns. 3 days increased volume is indicating for selling climax . advised to long at nifty sbi and dlf at lower prices at 2.28 PM after that market was recovered . Negative to gap down opening for nifty is expected with extremely volatile session ahead and possibility of gap filling till the time nifty will trade above 5600 but if in case slipped below 5600 and selling with volumes will be spotted bears will take it easily to 5500 5530… be alerted and plan your trades seeing market mood. As per current data we are expecting today’s range between 5600 5680 for spot nifty . 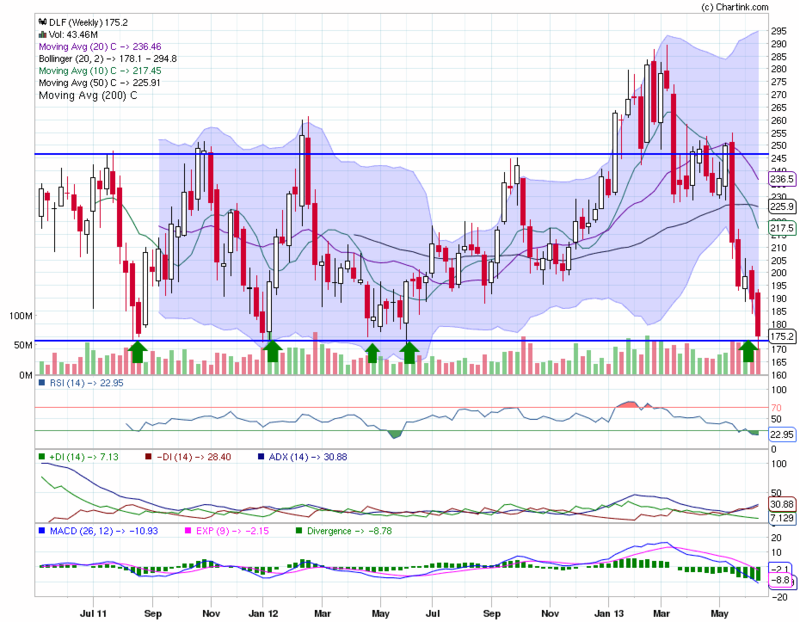 DLF is quite gud at 170 level buy on dips and book at high positional target 230 in 3 to 4 months more than 30% return is lucrative. Yesterday a fellow trader accepted that he made huge amount at chat room calls …but ignored advise to place stop loss order and booked 60000/- loss on single trade …now he will never trade without stop loss …he said that stoploss advised was giving him only 5 k loss but after paying 12 fold money he learnt the lesson and importance of stoploss order . buying dlf at 170 level is a low risk high reward trade . bank nifty is trading at up trending line support. 4 bear attempts were failed in last 1 year… will bears win this time? if yes then 10500 10000 will act as lower supports …consolidation /accumulation may take it to higher levels . we have advised you all to spot trend first select wave and then ride on it ..trend is friend of a trader …Dhanvarsha is helping genuine and small real traders to earn bread and butter through free chat room services available at many urls …where every one is getting calls and support of team dhanvarsha . if you are having your blog or web site and want to place this chat box … feel free to contact admin for its html code . by placing this chat box to your site/ blog you may help your traders group in receiving Dhanvarsha group of analysts calls / tips / suggestions and reply queries at open forum . SGX was below 1 % and buy at ce shared at 9.10 AM . traded at 25.10 and moved to 42 plus … net gain of 65% or more on call.. Trend can be spotted with the help of moving averages . 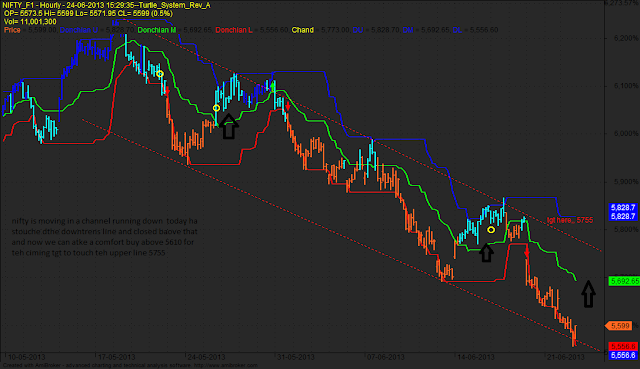 Apart from ce rehan shared nifty buy call ..
8 years Nifty weekly chart is showing that nifty is trading at bottom of up trending channel and if support wont break it will move to 6000 6300 level …downside is limited 5500-5525 is strong trend line support ..
we can use trend lines to spot trend . A period of extraordinary volume which comes at the end of a rapid and comprehensive decline which exhausts the margin reserves of many speculators or patience of investors. Total volume turnover may exceed any single day’s volume during the previous upswing as Panic Selling sweeps through the stock or commodity. Also called a Clean-Out Day, a Selling Climax reverses the technical conditions of the market. Although it is a form of a One-Day Reversal, it can take more than one day to complete. Rs 10000/- within 24 hours ….on single lot…. It becomes very difficult to judge about the intraday direction of market after 1 to 1.5 % gap down opening ..three possibilities will be there ..
so advising to wait for 10- 20 minutes and watch care fully what is going on… then trade accordingly with strict sl order punched in system ..
Asian equities widened their losses on Thursday after a dismal Chinese manufacturing report worsened sentiment that was already unnerved after the Federal Reserve confirmed fears of reducing its bond purchases later this year. Australia’s benchmark tumbled 2 percent, Japan’s benchmark Nikkei fell 1 percent,knocked off the previous day’s one-week high. Both South Korea’s benchmarkKospi and the Shanghai Composite traded at 2013 lows. Emerging Asia was also badly hit, with the Philippines’ benchmark index and Indonesia’s Jakarta Composite sinking 2.5 percent each. Yesterday it was predicted that nifty will trade in range with increased volatility …same happened ..Nifty traded between 50 points range .. Gross gain of 15 or more points . Volatility gives opportunity to book gains ,,so many times you can book gains ..as in sbi chart ..
Its upper level was 2070 75 and lower level was 2052 2050 ..
you may trade many times !! just start learning how to predict it …see we have already shared in advance .. If we can judge in advance why dont you??? Join our online trading /chart reading and prediction course and predict and trade like a pro ..
2. A variable in option pricing formulas showing the extent to which the return of the underlying asset will fluctuate between now and the option’s expiration. Volatility, as expressed as a percentage coefficient within option-pricing formulas, arises from daily trading activities. How volatility is measured will affect the value of the coefficient used.In other words, volatility refers to the amount of uncertainty or risk about the size of changes in a security’s value. A higher volatility means that a security’s value can potentially be spread out over a larger range of values. This means that the price of the security can change dramatically over a short time period in either direction. A lower volatility means that a security’s value does not fluctuate dramatically, but changes in value at a steady pace over a period of time. FIIs are selling every day and nifty is creeping up …why media is not propagating this now ….??? admin: we are expecting its possible support and resistance levels as per chart are Chart is self explanatory showing levels 11200 11400 12200 12400 12600 12900 13130 .. technical indicators are supporting bulls what ever may be the out come of RBI policy we are expecting 600 to 800 points upswing in bank nifty within a week or 2. week only if cracks below 11600 with heavy volumes which is next to impossible but surprises are always there so keep sl at 11600 for all positional LONG trades . NF gained 70 or more points and bank nifty 230 or more ..
Crude once sl triggered ..next call gained 30 plus points in crude..
Flat to positive opening is expected for nifty with extremely volatile session ahead …as we will see outcome of RBI policy today at 11 AM ..OMCs will catch fire today as petrol price hiked by 2 .
but we are expecting 1 more 100 points jump in nifty today …it seems that nifty will trade above 5900 today..
Chatroom will be active for real time updates and profit making calls based on technical analysis . Do not risk your hard earned money on your gut feelings . Spot the trend then enter in trade according to trend with proper stop loss order . bank nifty weekly chart is indicating that it has been bounced from its medium term support up trend line . we are expecting its possible support and resistance levels as per chart are Chart is self explanatory showing levels 11200 11400 12200 12400 12600 12900 13130 ..
technical indicators are supporting bulls what ever may be the out come of RBI policy we are expecting 600 to 800 points upswing in bank nifty within a week or 2.
week only if cracks below 11600 with heavy volumes which is next to impossible but surprises are always there so keep sl at 11600 for all positional long trades . And Premium at manthan chat room ..
Natural gas gained more than 5000/- on intra day trade . Market prices never move up or down in 1 go …moves like zig -zag or saw teeth …moves making waves …we can see swing high and swing lows in each time frame ..planned sell trade in natural gas at 220.50 . Natural gas gained more than 5000/- per traded lot on intra day trade . Moving averages are used to emphasize the direction of a trend and to smooth out price and volume fluctuations, or “noise”, that can confuse interpretation. Typically, upward momentum is confirmed when a short-term average (e.g.15-day) crosses above a longer-term average (e.g. 50-day). Downward momentum is confirmed when a short-term average crosses below a long-term average. A type of moving average that is similar to a simple moving average, except that more weight is given to the latest data. The exponential moving average is also known as “exponentially weighted moving average”. This type of moving average reacts faster to recent price changes than a simple moving average. The 12- and 26-day EMAs are the most popular short-term averages, and they are used to create indicators like the moving average convergence divergence (MACD) and the percentage price oscillator (PPO). In general, the 50- and 200-day EMAs are used as signals of long-term trends. levels to be observed for nifty spot in next week 5766 5800 5850 5900 5945 6065...nifty closed above 200 day moving average… if nifty will trade above 5820 it will break falling trend line and will move to 5950 6100…Fresh buying if done while nifty was falling then ok …as we shared in our view explaining selling climax … but last day nifty moved up due to short covering and nifty OI decreased by 157300 shares.No of contracts were average 242129.
need is nifty to trade above 5820 if wont sustain 5650 will be there . so predicting wider range 5650 to 6100 ..
Its up move is suspicious …if data display is correct . Gap up opening is expected with extremely volatile session ahead …possible trading range is expected between 5730 5790 ..